Welcome to the Dave Weckl Store! This is the place to find all things Dave Weckl, including a wide array of music, DVDs, books, shirts, drum gear, and more! You can save up to 15% when you bundle products that are sold directly from this site. Check out the featured projects, below, or use the links (right) to find Dave's recordings and products! Dave offers all kinds of play along products that allow you to be in the band. Some of them can be downloaded right when you purchase! This includes his recent Convergence project (full album), plus tunes with Oz Noy, George Whitty and Ric Fierabracci, and Gary Meek and Tom Kennedy! Many play alongs include videos of Dave's performances to help you master the tunes! Dave Weckl Acoustic Band LIVE DVD! Few acoustic jazz groups bring the kind of chemistry that this band brings. It's evident on the band's 2014 release, Of The Same Mind. But if you've seen this band live, you know that they take it an even higher level. This DVD captures the Dave Weckl Acoustic Band doing what great jazz groups do: pushing the boundaries of their tunes through live improvisation. The joy shared by these musicians is evident, and drummers will appreciate Dave swinging harder than ever. The DVD was filmed at the Catalina Jazz Club in Hollywood. Catalina's has become a kind of "home base" for Dave and his bands. For the many who haven't seen this band - and the many who have - fans can now sit down and enjoy this incredible group again and again! Flies On The Studio Wall is a two-hour movie about the making of Dave's 2014 release Convergence. Filmed mostly with small handy cams, the movie features rehearsal and session footage for all ten tunes. It also features plenty of fun behind-the-scenes footage, a comprehensive history of Dave and Jay, studio/gear info, and more! Of The Same Mind is the first release from The Dave Weckl Acoustic Band. This no-nonsense contemporary jazz group features Dave, Tom Kennedy (upright electric bass), Gary Meek (sax), and Makoto Ozone (piano/Rhodes/B3). You can learn more about the band and download here. 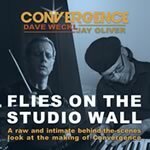 Convergence is an exciting new project from Dave Weckl and Jay Oliver! Jay was a major creative force behind Dave's first three solo releases and two Dave Weckl Band records (Rhythm of the Soul and Synergy). Convergence reunites these longtime musical counterparts with 10 new songs! Highlights of the album include a remake of Stevie Wonder's "Higher Ground," a nod to 1990's "Master Plan" which featured two drummers. This time, it's Dave, the incredible Chris Coleman, a first-call horn section, three gospel singers, and legendary players including Dean Brown (guitar) and Jimmy Johnson (bass). Additionally, play along versions of each song are available. These include mixes without each instrument and charts. The drum version includes a multi-camera video of Dave's actual session for each song! Also available: a behind-the-scenes DVD documentary! Learn more and purchase Convergence here. Save 15% When You purchase two or more items! The Dave Weckl store offers a 15% discount when you purchase two or more items through our shopping cart (links to third-party sites cannot be included). You will notice the discount when you check out! We appreciate your support of our independent store - and you'll see that it's worth it! All sales are final. The Dave Weckl store will replace any defective or damaged products at no cost to you. AAll U.S orders are shipped first-class except for T-Shirts and In Session books, which are sent by USPS Priority Mail. Outside of the United States, orders are shipped by "International Priority Mail." Due to strict customs situations in some countries, please allow up to three weeks for international orders. Write to us at questions@daveweckl.com . Thank you!